I don’t know too many people who don’t love pizza. It’s near the top of my list of all-time favorite foods, whether it’s a supreme, veggie, some gourmet concoction or just plain cheese. There are so many great places that will deliver, but sometimes I just like making my own. 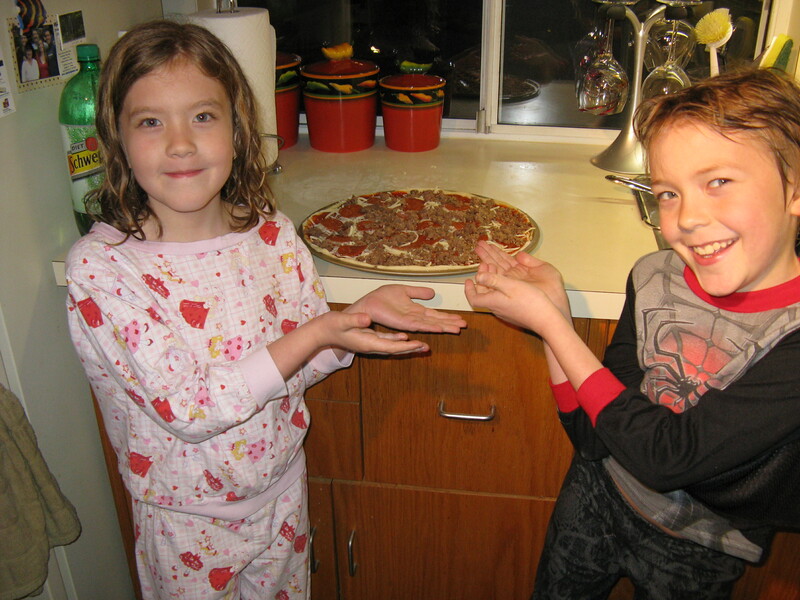 I have a super-easy dough recipe, and the kids love creating their own pies, piling the toppings on high. 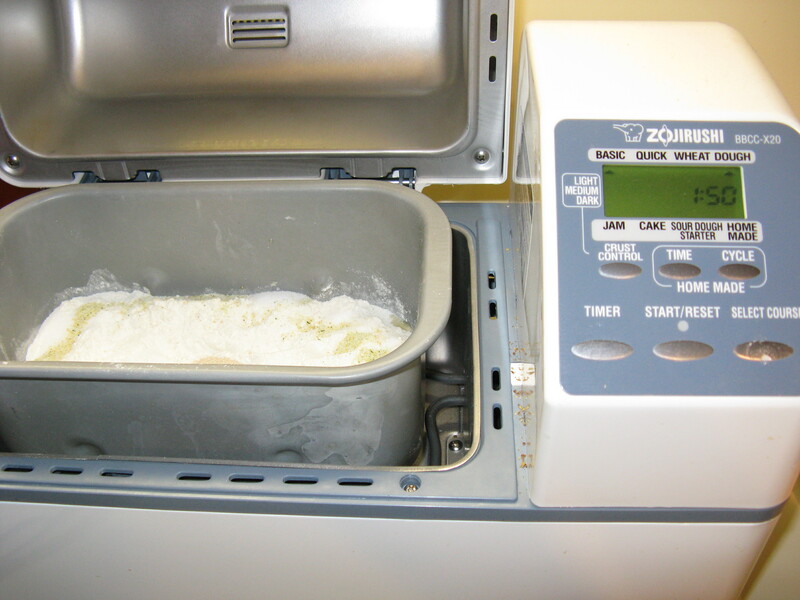 I cheat and use my bread machine to make a basic dough – it does all of the hard work. I love my bread machine, yes I do. 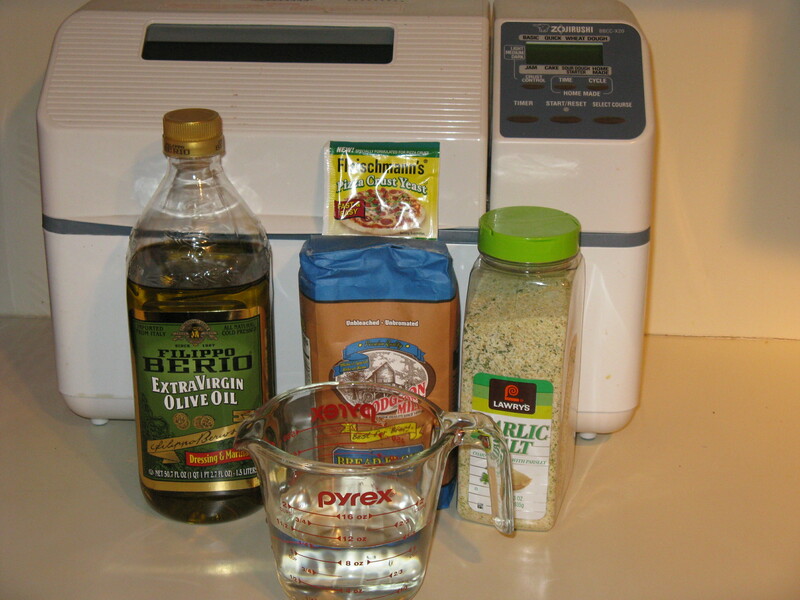 Add the ingredients according to your bread machine’s directions (I add mine in the order listed above.) Cook accordingly – for this dough I use the Quick setting, which takes 45 minutes. Once the dough is finished, remove it from the bread machine. Shape the dough into a ball. I divide the dough in half to make two 14” pizzas, and use this wonderful Williams-Sonoma Goldtouch® Nonstick Pizza Crisper ($21.00) that gives the pie a crisp, golden crust. 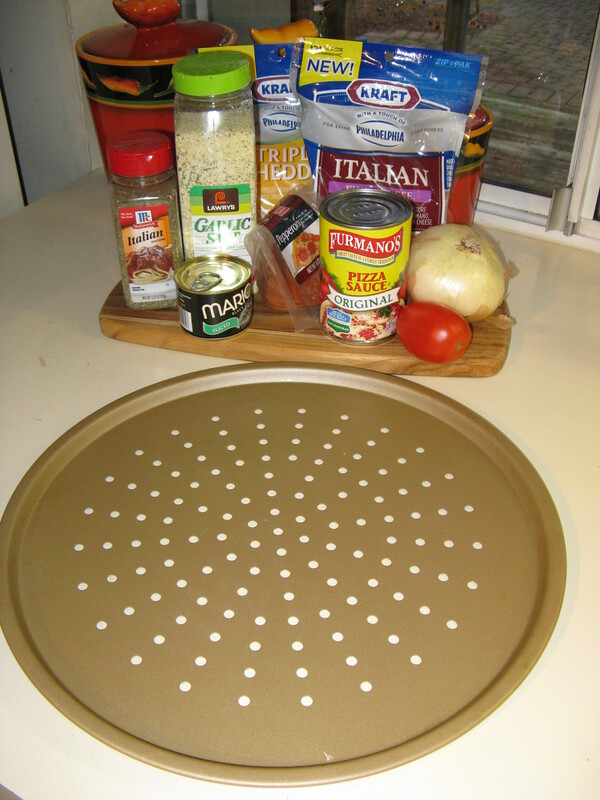 The pan has a perforated surface that exposes the bottom of the pizza to direct heat. It is one of my favorite pieces of bakeware, and well worth the money. Lightly flour your working surface and rolling pin, and roll the dough out until it will fit on the pan. Spray the pan with cooking spray. Place the rolled dough in the pan, and make sure that it comes all the way up to the edge. I “crinch” the dough against the side so the toppings won’t spill out. 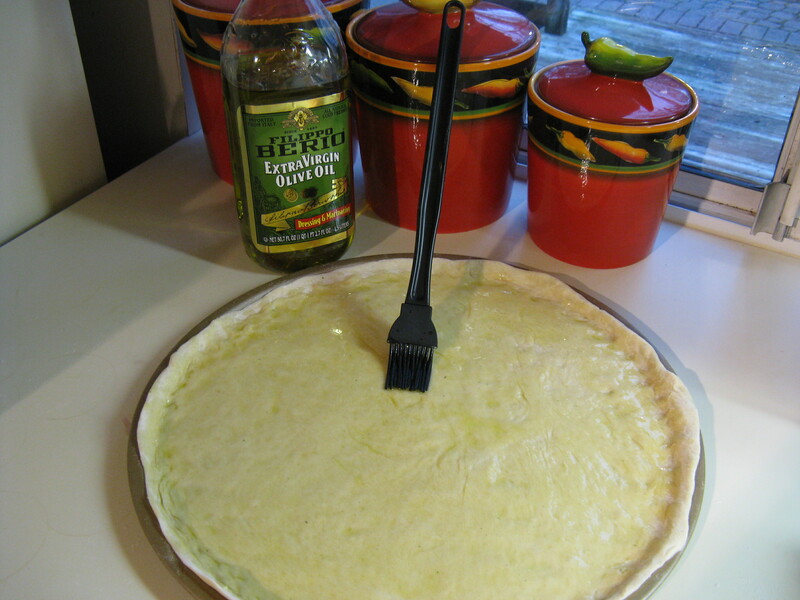 Brush the crust with olive oil, cover and let stand for 15 minutes. 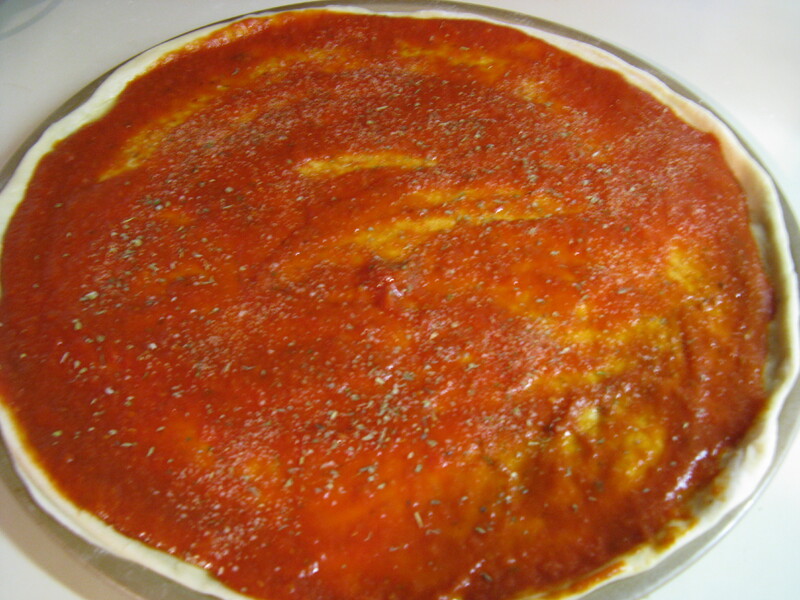 Spoon the sauce over the dough (you can either make your own or buy already made pizza sauce.) 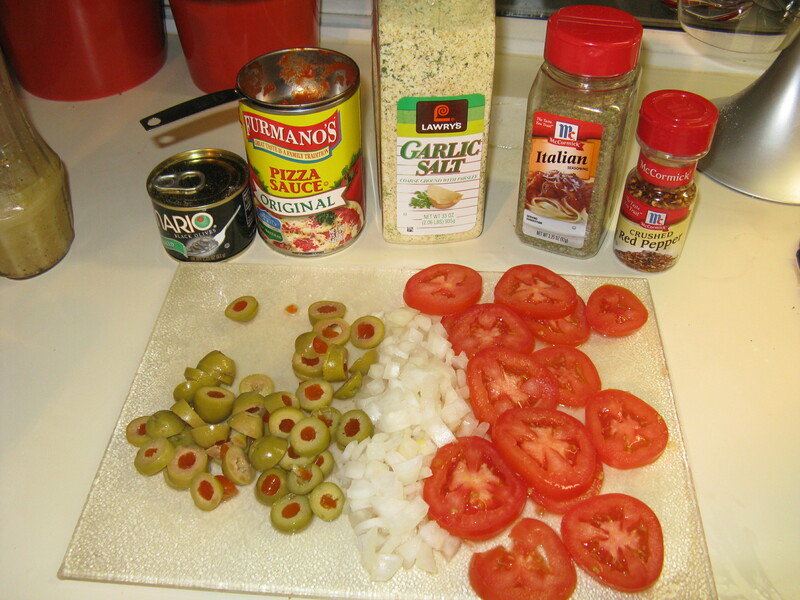 I usually sprinkle the sauce with garlic salt or powder and oregano. 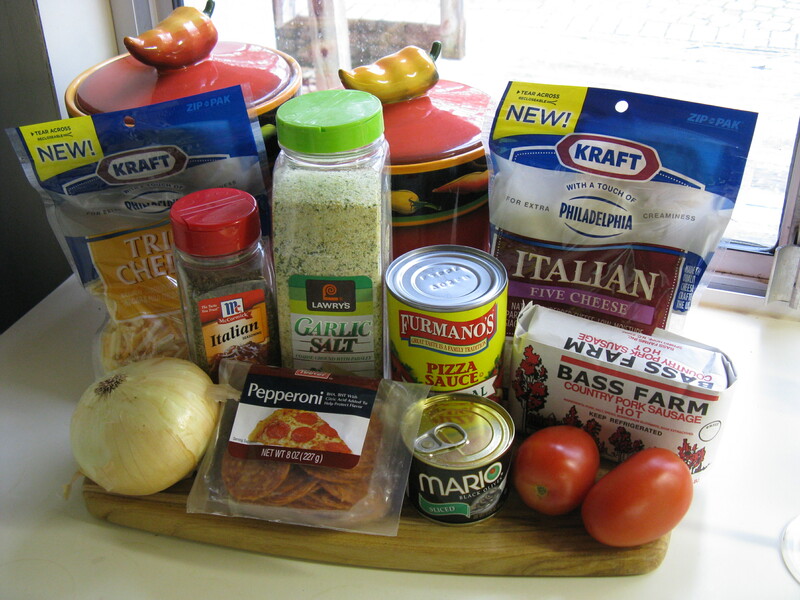 Top it with your choice(s) of cheese (I love to get the shredded stuff and use a few different types) and other ingredients. Bake for 15 minutes at 400 degrees F or until the cheese gets bubbly and the crust is golden brown. 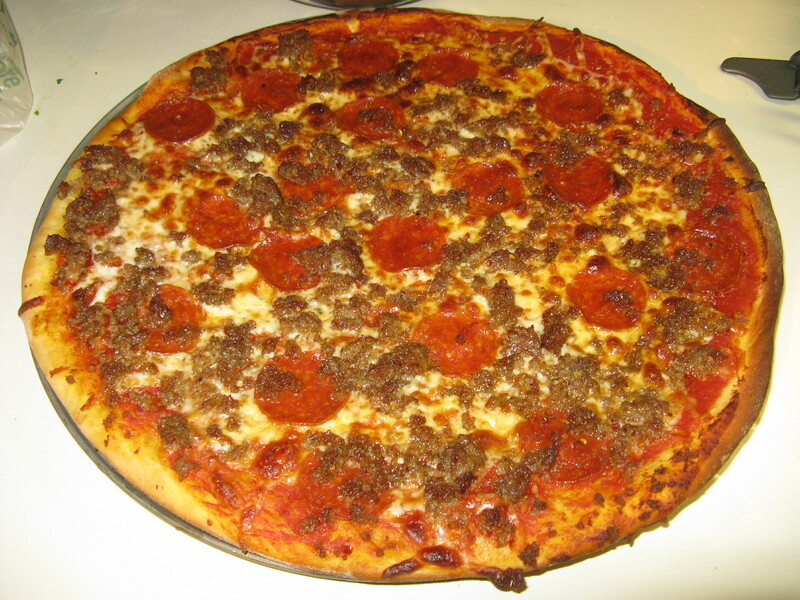 This time the kids chose pepperoni and sausage for their toppings. 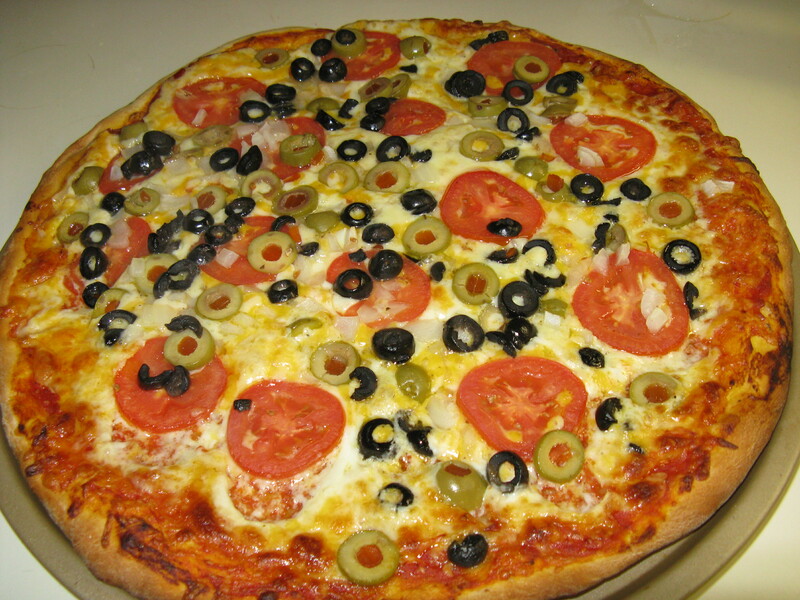 I created an “I love olives” pie and this is one of my favorite veggie pizzas. Brad chowed down on both. This stuff is awesome the next day (if there’s any left) and actually microwaves quite nicely. Otherwise, I just heat it in a frying pan with a tiny bit of oil until it is warmed through to keep the crust nice and crispy. Add a salad and a glass of wine, and it’s ready to devour! Please share your bread machine pizza dough recipes, especially any good herb crusts. This entry was posted in Meat and Poultry, Recipes and tagged bread machine pizza dough, comfort food, food blog, Homemade pizza, homemade pizza dough, Kelley Chisholm blog, kid friendly recipes, olive pizza, olive pizza recipes, pepperoni and sausage pizza, pizza dough recipe, pizza recipes, Raleigh food blog, vegetarian, vegetarian pizza, veggie pizza recipe, Willams and Sonoma Goldtouch pizza crisper, Zojirushi bread machine. Bookmark the permalink. 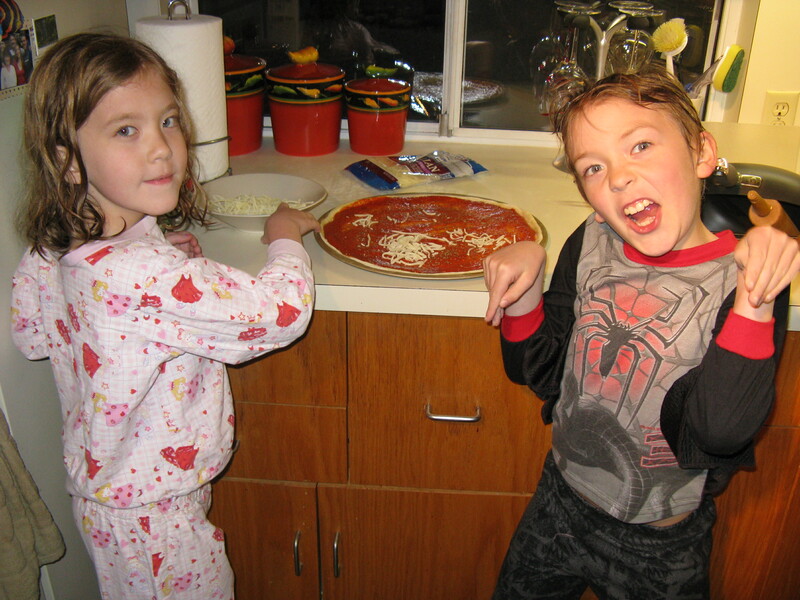 3 Responses to Homemade Pizza – Yum! 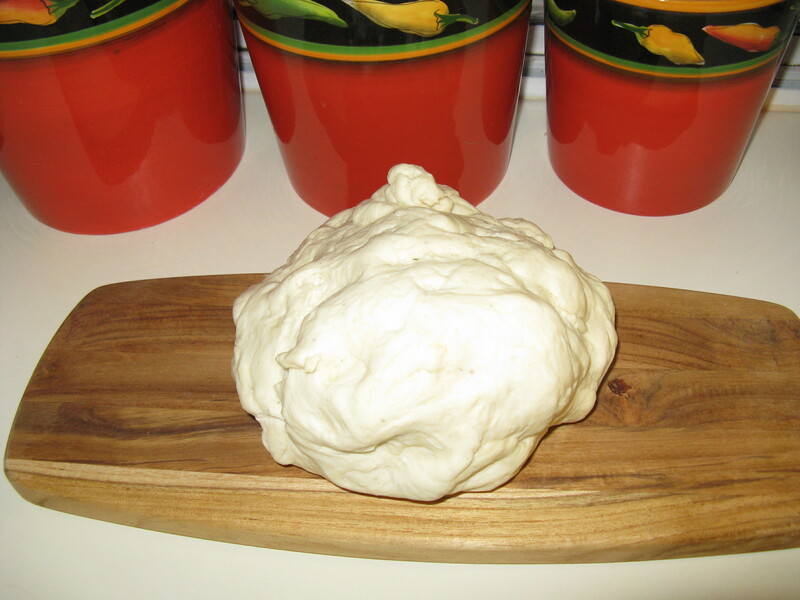 Dough makes 2-12″+ pizzas. Roll out dough on plenty of flour, rub with olive oil, prick with a fork in several places, then pre-cook in a 400 degree oven on a pizza stone for 5-7 minutes; add your favorite toppings and bake for 25-30 minutes.